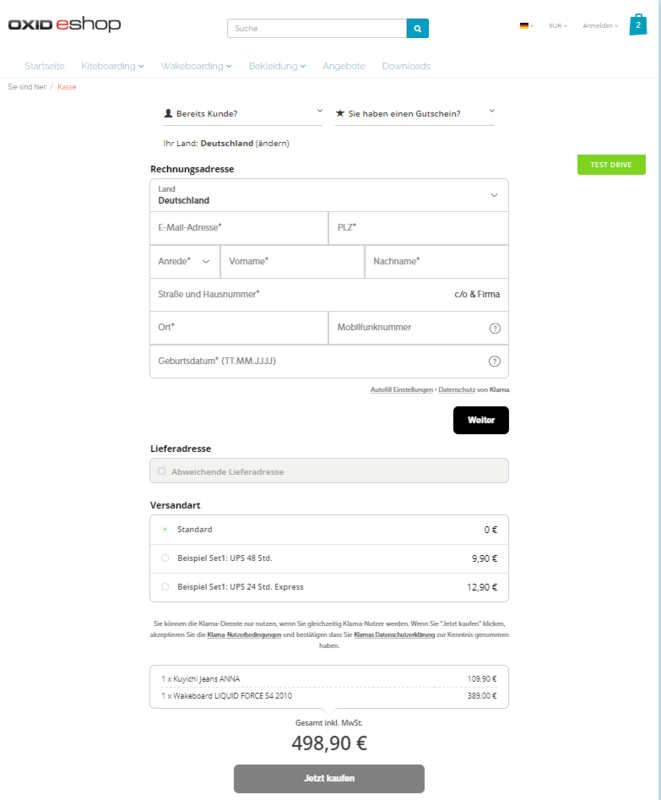 OXID eXchange | Klarna Checkout - Klarna Payments (CE) 4.1.0 | Stable | CE | 4.10.x - 6.1.x | Module, Themes, Language Packs direkt herunterladen! Klarna Checkout & Klarna Payments. Great customer experiences mean higher sales and happier customers. With Klarna, making a purchase is pure joy, and managing your business is easier than ever. Now, that’s smoooth. Klarna Checkout is the easiest way to shop online. It is also the fastest and safest way to sell. By tailoring the checkout to the shopper and making sure that everyone gets their own version of smoooth – especially on mobile – Klarna retailers are seeing significant increases in conversion. This in turn boosts business and promotes loyalty by providing a great customer experience. Additionally, Klarna Checkout includes Pay later as standard. It’s easy to let your customers try before they buy to futher boost conversion. Now shoppers can order goods and pay up to 30 days later. However, you are paid immediately in full. Register here and profit from all Klarna Checkout benefits. Slice it: Many online shoppers want to buy big ticket items or fill their ‘baskets’ but are held back by cash flow or credit costs. With Klarna’s Slice it, retailers remove these barriers, enabling consumers to buy using a monthly payment plan. Configure Slice it to your customer. Enable monthly payments over 3, 6 or 12-month plans or allow your customer the flexibility to self-select. Offer interest-free or interest-bearing plans, depending on your requirements. Pay later: Increasingly mobile and online shoppers want to see their goods before parting with their money. With Klarna’s Pay later, shoppers get 30 days from order shipment to pay for their purchase. Now you can remove payment friction at the checkout and let shoppers buy it, love it, then pay for it. Creating a better experience for your customers and a double-digit sales boost for your business. Pay now: FRICTION FREE DIRECT PAYMENTS. POWERED BY KLARNA. Accept all types of cards and alternative payment methods. Repeat purchases are one-click. Register here and profit from all Klarna Payments benefits. Klarna is now one of Europe’s largest banks and is providing payment solutions for 60 million consumers across 89,000 merchants in 14 countries. Klarna offers direct payments, pay after delivery options and instalment plans in a smooth one-click purchase experience that lets consumers pay when and how they prefer to. When the company acquired SOFORT in 2014 the Klarna Group was formed. Klarna is backed by investors such as Sequoia Capital, Bestseller, Permira, Visa and Atomico.